LOS ANGELES -- Following the failed bid for crippled automaker Saab by Swedish supercar maker Koenigsegg, Dutch exotic-car maker Spyker Cars is making its own attempt. In an interview this week at the Los Angeles Auto Show, Spyker CEO Victor Muller said he has begun discussions with Deutsche Bank, the agency behind any proposed transaction involving Saab. Spyker is mostly owned by Converse Group, a venture fund led by Russian bankers. Muller declined to give details of Spyker’s bid, citing a nondisclosure agreement. “People may wonder why a company that makes less than 100 cars a year can benefit from buying a company that makes more than 100,000,” Muller said. “Over time, there are massive benefits for Spyker tapping into Saab. 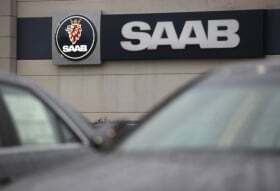 GM has said that if a buyer for Saab is not be found by the end of December, it will liquidate the brand, which could throw thousands of Swedes out of work. Muller declined to comment on GM’s seriousness regarding the deadline. But GM showed little mercy recently in liquidating Saturn after negotiations with dealer Roger Penske fell apart. Muller thinks Dutch leadership of a quirky Swedish automaker makes sense.